Primocin™ is the first antibiotic formulation designed to offer complete protection of primary cell lines from microbial contaminations. Primocin™ contains four compounds. Three of these compounds act on Gram+ bacteria, Gram- bacteria, and mycoplasmas by blocking DNA and protein synthesis. The fourth compound eradicates fungi, including yeasts, by disrupting ionic exchange through the cell membrane. Primocin™ has been used successfully with many primary cells, including mouse- and human-tumor derived cell lines , embryonic cells  and induced pluripotent stem cells [3-6]. 6. Zhou T. et al., 2012. Generation of human induced pluripotent stem cells from urine samples. Nat Protoc. 7(12):2080-9. One 1 ml vial of Primocin™ is sufficient to treat 500 ml of culture. One 20 ml bottle of Primocin™ is sufficient to treat 10 liters of culture. 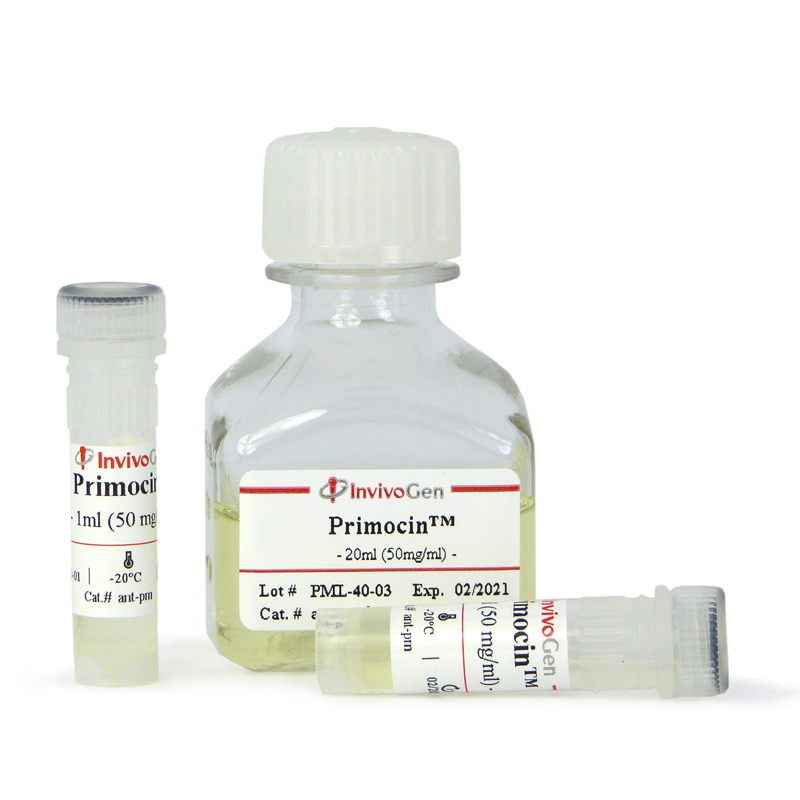 Primocin™ is provided as a cell culture tested, sterile filtered, light yellow solution at a concentration of 50 mg/ml. Primocin™ is shipped at room temperature. Correlation of in vitro cell adhesion, local shear flow and cell density. Measuring mutation accumulation in single human adult stem cells by whole-genome sequencing of organoid cultures. 2018 Stem Cell Res. 27:46-56. PRDM14 is expressed in germ cell tumors with constitutive overexpression altering human germline differentiation and proliferation. Clearance of senescent glial cells prevents tau-dependent pathology and cognitive decline. 2018 Curr Protoc Stem Cell Biol. 45(1):e48. Generation of Human Induced Pluripotent Stem Cells Using a Defined, Feeder-Free Reprogramming System. Park S. et Mostoslavsky G.
Tumor Evolution and Drug Response in Patient-Derived Organoid Models of Bladder Cancer. Colonoscopy-based colorectal cancer modeling in mice with CRISPR–Cas9 genome editing and organoid transplantation. The Use of Biocompatible Alginate Scaffolds Covalently Modified with Cyclic RGDfK Peptides to Improve Survival of Transplanted Cells and Angiogenesis in Damaged Myocardium. Disabled cell density sensing leads to dysregulated cholesterol synthesis in glioblastoma. A microengineered collagen scaffold for generating a polarized crypt-villus architecture of human small intestinal epithelium. 2017 J Biol Chem. 292(12):4833-4846. ETS Proto-Oncogene 1 Transcriptionally Up-regulates the Cholangiocyte Senescence-associated Protein Cyclin Dependent Kinase Inhibitor 2A. Decreased Motor Neuron Support by SMA Astrocytes due to Diminished MCP1 Secretion. Use of a gamma-2 herpesvirus as a vector to deliver antibodies to rhesus monkeys. cGMP production of patient-specific iPSCs and photoreceptor precursor cells to treat retinal degenerative blindness. HIV-1–Mediated BAFF Secretion in Macrophages Does Not Require Endosomal TLRs, Type-I IFN, and Nef, but Depends on the Cellular Phenotype Status. Capturing the biology of disease severity in a PSC-based model of familial dysautonomia. Sensing of HSV-1 by the cGAS–STING pathway in microglia orchestrates antiviral defence in the CNS. Isolation and cultivation of naive-like human pluripotent stem cells based on HERVH expression. Wang J, Singh M, Sun C, Besser D, Prigione A, Ivics Z, Hurst LD, Izsvák Z.
Reprogramming triggers endogenous L1 and Alu retrotransposition in human induced pluripotent stem cells. Transduction of an immortalized olfactory ensheathing glia cell line with the green fluorescent protein (GFP) gene: Evaluation of its neuroregenerative capacity as a proof of concept. Plaza N, Simón D, Sierra J, Moreno-Flores MT. Cryopreserved Ex Vivo-Expanded Allogeneic Myeloid Progenitor Cell Product Protects Neutropenic Mice From a Lethal Fungal Infection. Domen J, Christensen JL, Gille D, Smith-Berdan S, Fong T, Brown JM, Sedello AK. Organoid models of human and mouse ductal pancreatic cancer. 2015 J Exp Med. 212(6):953-70. DYRK1A controls the transition from proliferation to quiescence during lymphoid development by destabilizing Cyclin D3. Thompson BJ, Bhansali R, Diebold L, Cook DE, Stolzenburg L, Casagrande AS, Besson T, Leblond B, Désiré L, Malinge S, Crispino JD. KIR3DL01 recognition of Bw4 ligands in the rhesus macaque: maintenance of Bw4 specificity since the divergence of apes and Old World monkeys. Modulation of ten-eleven translocation 1 (TET1), Isocitrate Dehydrogenase (IDH) expression, α-Ketoglutarate (α-KG), and DNA hydroxymethylation levels by interleukin-1β in primary human chondrocytes. BRAF Inhibitors Induce Metastasis in RAS Mutant or Inhibitor-Resistant Melanoma Cells by Reactivating MEK and ERK Signaling. Broad and adaptable RNA structure recognition by the human interferon-induced tetratricopeptide repeat protein IFIT5. PCSK6 regulated by LH inhibits the apoptosis of human granulosa cells via activin A and TGFβ2. Epstein-Barr virus utilizes Ikaros in regulating its latent-lytic switch in B cells. Engraftment of human iPS cells and allogeneic porcine cells into pigs with inactivated RAG2 and accompanying severe combined immunodeficiency. Lee K, Kwon DN, Ezashi T, Choi YJ, Park C, Ericsson AC, Brown AN, Samuel MS, Park KW, Walters EM, Kim DY, Kim JH, Franklin CL, Murphy CN, Roberts RM, Prather RS, Kim JH.